We Regret to inform you that 22593240 Pte Lawrence William Reginald Gardner passed away at Worcester Royal Hospital on the 19th of March 2015. Lawrence enlisted into the 1st Battalion The Worcestershire Regiment on the 20th September 1951. Lawrence Served in Malaya as a signaller and was discharged on the 17th September 1953. He started civilian life as a carpet fitter for Francis` of Malvern, then going on to work as a subcontractor until retirement. The funeral will be held on 9th April at 10:15 at Lansdowne Methodist Church, Lansdowne Crescent. Malvern. Worc`s WR14 2AP. Standard Bearers and Association Members Welcome. Letters of condolence can be written to Lawrence`s wife , Mrs Margaret Gardner. 144 Brook Farm Drive, Malvern. Worc`s. WR14 3SJ. It is with sadness we inform you that 2 Lt John GOATLY of Fernhurst, West Sussex died on 31 March 2012 aged 94. John (Hoppy) joined the 1/5th Battalion The Sherwood Foresters in February 1940 and went with it as part of the BEF to France before being evacuated through Brittany some time after France had fallen. He then went with the Battalion to the Far East where he served as the battalion intelligence officer in Singapore. John was taken prisoner by the Japanese from hospital on 15 February 1942 after being wounded in the left lower leg by a bullet at Bukit Timah. He was placed in work group 7, at Kanburi and held in various working camps until released in 1945. His funeral is to take place at St Margaret’s Church, Fernhurst, West Sussex on Wednesday 11 April2012 at 1300 hours. It is with regret that we inform you that 22797121 Cpl Derek GOODMAN of South Normanton, Derbyshire died on 19 January 2013 aged 78. ‘Benny’ joined the 2nd Battalion Sherwood Foresters in March 1952 as a National Serviceman and was posted to the Royal Warwickshire Regiment in March 1953 for service in Korea. He left the Army in 1955. It is with sadness we notify you that 4979497 Sgt Walter GOODYEAR of Derby died on 20 December 2016 aged 99. Walter enlisted at Derby on 15 February 1940 and served with 14 Battalion The Sherwood Foresters throughout North Africa, the Anzio Beachhead and the Gothic Line in Italy until it was disbanded on 30 December 1940. He was then posted to IRTD at Benivento Graz, Austria and then 5CCG before being demobbed on 1 February 1946. Funeral details will be promulgated when known. It is with regret we inform you that Pte 14377539 William Arthur GOUGH died on 11 June 2015 aged 91 years. Arthur joined 1st Battalion the Worcestershire Regiment in 1943 and fought with the battalion in Normandy in the Caen battles including Hill 112, Mont Pincon and Berjou. He was at Vernon for the Seine crossing and in the advance into Holland and Germany. He was a Dispatch Rider and following a motor cycle accident in early 1945 was discharged later that year. His funeral was held at St. Michael's Church, St. Michaels, near Tenbury Wells at 1200 hrs on Monday 29 June. It is with sadness that we inform you that 1434845 LCpl Charles Edward GOUGH passed away last month aged 95. “Ted” originally enlisted into the Royal Artillery, Heavy Anti Aircraft, and transferred to the Worcestershire Regimentduring World War 2. He was released in January 1946. It with sadness that we inform you that 23982884 Cpl Patrick Greenan, 1 WORC R and later 1 WFR died on 19th July 2012 aged 66. Paddy joined 1st Battalion The Worcestershire Regiment on 6 Sep 1963 and served with it in Gibraltar, Tobruk , Cyprus and UK . He served after amalgamation with 1 WFR and left the Army in May 1971. It is with regret that we notify you that 22953775 WO1 JJ GREGORY of Gressenhall died on 18 February 2018 aged 84. "Gentleman Jim" enlisted in 1953 and after basic training at Norton served with 1 Worc R in Iserlohn before returning to the Depot as a Sgt instructor. He then rejoined 1 Worc R in the West Indies and continued to serve with it in Minden, Gibraltar, Tobruk and with 1 WFR on the 1972 NI tour. On promotion to WO1 he served as RSM of 1 Mercian Volunteers and for his last year of service before discharge in 1975 he served another 6 months in NI. In retirement he was a very keen golfer. The funeral will take place at 1300 hours on Thursday 15 March at St Mary's, Church Lane, Gressenhall, Dereham, Norfolk NR19 2QH. Members and Standards welcome. It is with regret we notify you that 5732344 WO2 Albert GRICE of Kidderminster died on 5 January 2014 aged 89. Albert enlisted into the Dorset Regiment in WW2 before transferring to 1st Battalion The Worcestershire Regiment where he served with C Coy in Iserlohn, Germany and British Guyana. In 1959 he was posted to 7th Battalion The Worcestershire Regiment as a PSI and in 1960 was promoted to WO2. He returned to the 1st Battalion in 1962. Funeral details willbe promulgated when known. It is with regret we notify you that 4987104 CSgt (CQMS) Albert William Everitt GROCOCK of Newark, Nottinghamshire died on 14 April 2016 aged 93. Albert enlisted in 1942 into 1st Battalion The Sherwood Foresters before being posted to the 2nd Battalion The Sherwood Foresters and served with it in Anzio, Palestine, Egypt, Syria, Lebanon and Jordan. In 1947 he was posted to the Depot, Derby before beingattached to 17 PTC in Leicester. He left the Army in 1949. Albert was a long time member and staunch supporter of Newark WFRA. His funeral service is to be held on Tuesday 3 May 2016 at 1200 hours at Hawtonville Methodist Church, Beech Avenue, Newark NG24 4JN. Family Flowers only. Donations may be made to Church Funds. Funeral Directors E Gill & Sons Ltd, 55 Albert Street, Newark NG24 4BQ. It is with regret that we inform you that 24203909 Pte Stuart HALL of Mansfield died on 31 July 2018 aged 65. Kes enlisted into The Worcestershire and Sherwood Foresters Regiment in May 1970 as a Junior soldier and after joining the Regiment served with it in UK, BAOR, Berlin and NI. He left the Army in May 1974. In civilian life Kes worked with the National Coal Board and was an enthusiastic volunteer at Foresters House in Chilwell with the Regimental Museum and RHQ until 2011. The funeral will take place on Wednesday 22 August at 1430 hours at Tythe Green Burial Grounds, Salterford Lane, NG14 6NZ. The family have requested no flowers and that any donations will be given to the Crich Memorial Fund. The wake will be held at The Arena (formally the Welfare) on Clipstone Road, Forest Town NG19 0EE. All are welcome to both including Standard Bearers. The family have requested that letters of condolence should be sent to RHQ Nottingham, Foresters House, Chetwynd Bks, Chilwell Nottingham NG9 5HA. It is with sadness that we notify you that 4978845 Sgt Archie HALLAM DCM of Eastwood, Nottinghamshire on 2 April 2010 aged 90. He joined the 2nd/5th Battalion Sherwood Foresters at Allestree Park in 1939 and went with it to France as part of the BEF. He was later evacuated through Dunkirk. Whilst at Galashiels he broke his thumb while playing football and spent several weeks in hospital. On discharge from hospital he was posted to the newly formed 14th Battalion Sherwood Foresters at Markeaton Park Derby. He went with it to North Africa and was involved in the Battle of El Alamein later moving with the Eighth Army to Tunis. He then went to Anzio with the Battalion where he was wounded by shrapnel. On returning to duty he remained with the 14th Battalion until it was disbanded at the Battle of San Savino where he won his DCM.. He was then posted to 6th Battalion The York and Lancaster Regiment in Austria in December 1944 before being discharged in April 1946. He then returned to Eastwood and became an Engine Winder at Underwood Colliery until he retired at age 65. He was recommended for the MM but was given an immediate award of the DCM. "For outstanding bravery and initiative in the fighting at San Savino on the night of 5/6 September 1944 and on 13 September 1944. During the night 5/6th September, B Coy were ordered to attack San Savino. Early in the attack the Platoon Commander and Platoon Sergeant of Corporal Hallam's platoon both became casualties. The fighting became very confused owing to the presence of enemy tanks in the built up area. Cpl Hallam, however, immediately assumed command of the platoon and quickly gained control of a situation which, without adequate leadership, would have prejudiced the outcome of the operation. He quickly reorganised the platoon and commanded it with skill and initiative throughout the heavy fighting which followed. Again in the dawn attack on San Savino on 13th September the Platoon Commander and Platoon Sergeant of Cpl Hallam's platoon were wounded on the S.L. Cpl Hallam again assumed command and carried out the intricate and difficult task which had been allotted to his platoon. He assaulted and seized a key house in the village from which two enemy machine guns were firing. The seizure of this house did much to ensure the success of the whole operation. Cpl Hallam then led his men to attack and capture two further houses, taking many prisoners and making a firm base from which the rest of his company were able to complete its task with success. The outstanding initiative and determination of this NCO to hit the enemy on every possible occasion did much to ensure the success of the Battalion attack. He displayed all the best qualities of a junior leader, and his power to inspire men and to make quick decisions were an example to all." It is with sadness that we inform you that Pte 14406670 Charles George HARDING of Worcester died on 21 November 2018 aged 93. Charles served with C Coy 1st Battalion The Worcestershire Regiment. His funeral is to take place at 1000 hours Monday 10 December 2018 at Astwood Crematorium, Tintern Avenue, Astwood Road, Worcester WR3 8HA. be pleased to hear from any friends or comrades. Rolly can be contacted on 01204 435223. It is with sadness we inform you that 5258274 Sgt Harry HARRISON CBE of Droitwich Spa, Worcestershire died on 12 March 2016. Harry enlisted in June 1940 in 11th Battalion The Worcestershire Regiment and served in C Coy. When the 11th Battalion became 1st Battalion The Worcestershire Regiment he remained with it serving in North West Europe throughout World War 2. He left the Army in 1946 and was later awarded the CBE for his work in engineering. It is with regret we inform you that 24503152 Michael A HARRISON of Long Eaton, Derbyshire died on 13 January 2015 aged 53. Mick enlisted into the 1st Battalion The Worcestershire and Sherwood Foresters Regiment on 11 September 1978 and left on 31 January 1986. He served in the Corps of Drums. Funeral details will be promulgated once known. 18 April at 1130 hours. Branch Standards Welcome. It is with sadness that we report that 30144038 Pte Matthew Sean James HASELDIN of Settle, Yorkshire was KIA in Afghanistan on Thu 3 November 2011 aged 21. Matthew enlisted into The Mercian Regiment in February 2011 and was posted to the 2nd Battalion The Mercian Regiment in August 2011 where he served with C Coy and in September he deployed with the Battalion to Afghanistan . Matthew was KIA in the Nahr-e Saraj district of Helmand province while on an operation to maintain freedom of movement for the local population, when his patrol came under attack from insurgents and he sustained a fatal gunshot wound. Matthew is to be repatriated through Brize Norton on Thursday 10 November 2011. For those wishing to write in condolence, all correspondence should be addressed to Mr Alan Haseldin, c/o Capt J Pickering, RHQ MERCIAN, Heath Avenue, Whittington Barracks, Lichfield, Staffordshire WS14 9TJ. It is with sadness we inform you that 451261 A/Capt John Barry (Tracker) HENTON of Merton, Oxon died on 31 December 2013 aged 78. Tracker was commissioned into the 1st Battalion The Sherwood Foresters in October 1956 and served in Malaya as OC Tracker Platoon in 1959 before being posted in 1960 to the Depot Staff in Derby. He left the Army in 1962. His funeral is to take place at Oxford Crematorium, Bayswater Road, Headington, Oxon OX3 9RZ on Thursday 16 January 2014 at 1115 hours. The family invite mourners to join them at Studley Golf Club in Horton after the committal. It is with regret we inform you that 14375398 Pte Ronald Herbert HICKMAN of Witney, Oxford died on 3 March 2016 aged 94. Ron joined the 2nd/5th Battalion The Sherwood Foresters at Bizerta, Italy in August 1943 and served in B Coy. He was wounded at Volturno and evacuated to North Africa. He was then transferred to the Dorset Regiment in May 1946. He was a founder member of the Oxfordshire Branch of the Italy Star Association. His funeral is to take place at St Mary's Church, Witney, Oxfordshire on Thursday 31 March 2016 at 1300 hours. 23253233 L/Cpl Barry Hill of Pedmore Worcestershire died on 22 August 2015. It is with sadness we inform you that 22375049 Pte Reginald Ernest HILL passed away in hospital on Saturday 8th October 2016. Reginald enlisted into the Worcestershire Regiment as a National Service Soldier in 1950. Reg saw service in Malaya with 'C' Company, 1st Battalion Worcestershire Regiment, then being discharged in 1952. In civilian life Reg worked at Metal Box, Worcester for over 30 years. Reg`s Funeral will be held at 12:15hrs on the 25th October 2016 at Worcester Crematorium, Astwood Road. Worcester. WR3 8EB. Standards and Association members welcome. It is with sadness that we notify you that Mrs Mary Clare HINCE, wife of the late Brig Charles Hince died on 2 January 2019 aged 89. 8th Battalion Sherwood Foresters in 1961 to become the 5th/8th Battalion Sherwood Foresters. After completing his TA service he joined the Derbyshire Army Cadet Force as Chief Clerk and served with it from 1976 to 1982.
as a reinforcement to 1st Battalion The Worcestershire Regiment in North Africa and was taken PoW when Tobruk fell in June 1942. In late 1942 he was transferred to a PoW camp in Italy from which he absconded after the Italian surrender in September 1943. He was recaptured twice but escaped again on each occasion. He was awarded the MM for his courageous escape activities. On returning home after hostilities ceased in Italy he was transferred to the RAOC until demobilisation after the war. It is with regret we inform you that Lt E Roger HOFFEN of London died on 6 October 2012 aged 76. Roger served with the 8th Battalion Sherwood Foresters in 1955. It is with regret that we inform you that 484882 Maj Andrew Henry HOPKINS of Llanfaes, Brecon died on 19 September 2018 aged 71. Andrew was commissioned into the Sherwood Foresters in 1969 and was appointed Mortar Pl Comd 1^st Battalion The Worcestershire and Sherwood Foresters Regiment 1971 to 1972 before taking up the post of RSO 1972 – 74 in Berlin. He was then posted to Infantry Junior Leaders Battalion 1974 to 1976 as RSO before taking up the post of IO in UK/NI with 1 WFR 1977 -78. In 1978 he was posted to UKLF as MILO until 1979 when he attended ASC Camberley to 1980. Andrew was then posted to HQ UDR as COS 1981 – 82 before being detached to 1^st Hampshire Regiment as a Coy Comd in UK and Berlin 1983 to 1985. He was then appointed as Trg Major 3 WFR 1985 – 87 and left the Regiment on 29 September 1987. The funeral of Maj Andrew HOPKINS which takes place on Friday 5 October 2018 is family only. Letters of condolence to Mrs Viv Hopkins, 32 Penyfan Road, Llanfaes, Brecon LD3 8DB. to take place at Amersham Crematorium on 30 January 2012 at 1130 hours. For those wishing to write in condolence, Mrs W Hoyle’s address is held by RHQ. It is with regret we inform you that 23791728 Pte Ronald HURST of Newark died on 19 July 2011 aged 72. Ronald served with A Coy 1st Battalion The Sherwood Foresters as a National Serviceman 1959 – 1961. It is with regret that we inform you that 4975485 Sgt William Henry (Harry) JACKSON of Mansfield died on Saturday 7 July 2018 aged 99. Harry enlisted into the 8th Battalion Sherwood Foresters on 8 June 1937 and went with it in April 1940 to Norway where he managed to make his way to Sweden where he was interned. He subsequently returned to the Battalion and in July 1941 transferred to the Pioneer Corps. Harry was President of Mansfield Branch and was a long serving staunch supporter of both the Branch and the wider Regimental Family and Military Veterans groups.The funeral is to take place at St Edmund’s Church, Church Street, Mansfield Woodhouse, NG19 8AH, at 1100 hours on Tuesday 31 July 2018 followed by committal at Mansfield Crematorium, Derby Road, Mansfield at 12.15 pm. Members and Standards welcome. It is with regret that we notify you that 24150977 A/CSgt Stephen Jaffrey of Worksop died on 23 October 2015 aged 66. Steve enlisted in 1976 with 3WFR and served with HQ and E Coy. He was discharged in 1988 after 12 years service. His funeral will be on Tuesday 3rd November 2015 at 1450 hours at Brimington Crematorium, Chesterfield S43 1AU. Association Standards and members welcome. It is with sadness we notify you that Pte Denis Roy JAKEMAN of Wolverhampton died on 5 March 2016. Roy served with 1st Battalion The Worcestershire Regiment as a National Serviceman from April 1956 to May 1958. He saw service in the Caribbean, Belize, North Africa and BAOR. On leaving the Army he served with the TA until 1964. It is with regret that we inform you that 5253719 Pte Walter Arthur James of Worcester died on 11 August 2013 aged 94. He served with the 1st Battalion The Worcestershire Regiment from 1939 in India and Germany and demobilised in 1945. His funeral will take place at St John’s Church, Worcester WR2 5BS at 1315 hours on the 23 August. For those wishing to write in condolence his next of kin is his nephew Mr P James, Priest Hole, Priestfields, Hanley Castle, Worcestershire WR8 0AU. It is with sadness we inform you that 22672858 Cpl Peter Arbon JEFFREY of Ilkeston, Derbyshire died on 29 July 2012 aged 78. Peter joined the 2nd Battalion The Sherwood Foresters as a National Serviceman in 1951 and was discharged in 1954. On leaving the Army he worked for Derbyshire Fire and Rescue Service. Peter was a former Borough Councillor and Mayor of Erewash and was a founder member and Branch Secretary of Ilkeston Branch WFRA. We regret to inform you of the death of 24049857 Pte Kenneth Charles JEWKES of Dudley died on the 21st June 2016 aged 70. Kenneth enlisted at Wolverhampton into the 1st Battalion The Worcestershire Regiment on the 3rd March 1965. Kenneth trained as a tracked vehicle driver in which "He showed great interest in his vehicle and cheerfully worked long hours on maintenance". Kenneth went on to serve in the UK, Gibraltar, Tobruk, and Cyprus. Kenneth was discharged on 29th October 1971 at Warminster, going on to serve with the reserve until 1977. In civilian life Kenneth worked in Highway Maintenance for Dudley Council until retirement. The Funeral will be held on Thursday the 7th July at 14:00hrs at Gornal Wood Crematorium, Chase Road, Gornal Wood, Dudley. West Midlands DY3 2RL. Association members welcome. It is with regret that we inform you that Captain Kenneth William JOHNSON of Southend-on-Sea, Essex died on 31 January 2012 aged 91. Johnny was commissioned into the Royal Artillery and was then transferred to 2nd/5th Battalion The Sherwood Foresters in Italy in October 1944 and appointed OC A Coy. He was involved in the last few battles of the Gothic Line Assault before moving to Greece, Italy and Austria with the Battalion. It is with regret that we notify you that 22847593 CSgt G. Thomas JONES died on 14 July 2018. Tom enlisted into 1st Battalion The Worcestershire Regiment and after amalgamation served with 1st Battalion The Worcestershire and Sherwood Foresters Regiment until he was discharged on 30 July 1976 on Completion of Service. Funeral details will be notified when known. It is with sadness that we notify you that 14845660 Sgt Peter Rowland JONES of Coventry died on 29 January 2018 aged 93. Peter was called up into the DCLI in 1944 and after transfer to the Worcestershire Regiment served with the 9th Battallion. When it disbanded and after several moves Peter was posted to the Depot at Norton Barracks and became Orderly Room Sergeant until being released in 1949. Whilst there he developed an interest in welfare and formed the Coventry and South Midlands Branch, remaining as its Secretary and Standard Bearer for the rest of his life. An enthusiastic and tireless supporter to the Regimental Association for many years he held both the WRA and WFRA Merit Awards His funeral will be held on Friday 9 March at Canley Crematorium, Charter Avenue, Coventry CV4 7DF 1030 hours followed by the wake at The Standard Club, Tile Hill Lane, Coventry CV4 9DG. The family have requested donations only to Myton Hospice in Warwick. All Standard Bearers, Association members and their families are invited to attend. Letters of condolence can be sent to his daughter, Mrs Carol Clark at 10 Westcotes, Tile Hill, Coventry, CV4 9BD. It is with regret that we inform you that 22435117 Private Ronald James JUKES of Birmingham died on 5 October 2015 aged 83 years. Ron was called up as a National Serviceman in November 1950 and served with the RASC until May 1951 when he transferred into the 1st Battalion The Sherwood Foresters in Germany. He completed his service on 30 November 1952. Ron was the Standard Bearer for Birmingham Branch and when that Branch went into suspended animation he continued to carry the Standard at the Annual Pilgrimage to Crich and many other events. His funeral is to take place on Monday 19 October 2015 at Rowley Regis Crematoriam, Powke Lane, Rowley Regis, West Midlands B65 0AD at 1345 hours. Family flowers only. Donations for the Stroke Association may be sent c/o Andrew Jones of F P Gaunt Sons Ltd, High Street, Blackheath B65 0EE. It is with regret that we inform you that 23515671 Pte Gordon Robert KEETLEY (also known as Robert England) of Nottingham died on 2 February 2017 aged 76. Gordon was called up as a National Serviceman in June 1957 and joined the 1st Battalion Sherwood Foresters and served with it in Malaya and Borneo before moving to 17th Ghurka Division. He left the Army in June 1960. His funeral is to take place at Wilford Hill Crematorium, Nottingham on Monday 27 February 2017 at 0940 hours. Refreshments afterwards at the Coopers Arms (Top House), Hoewood Road, Bulwell. Family flowers only but donations may be made to Army of Angels. It is with regret that we inform you that 14704066 Pte Eric Raymond KING of Warley, West Midlands died on 25 September 2016 aged 91. Eric was called up in January 1944 and on completion of training was posted to the 6th Battalion The North Staffordshire Regiment with which he went to France 23 days after D Day. In August 1944 he was posted as a re-inforcement to 1st Battalion The Worcestershire Regiment after the crossing of the Orme and served with B Coy. On 20 September he moved with the Battalion in the long column to Eindhoven where the Battalion went forward to Elst and after fierce fighting cleared the town on 25 September. The next major battle for the Worcestershire Regiment was Tripsrath in November. In May 1945 Eric was again posted, this time to 2nd Battalion The Warwickshire Regiment and with it served in Palestine and Egypt. He was demobbed from the Army in December 1947. In civilian life Eric became a postman. His funeral has taken place. It is with sadness we report that Worcester Branch Member 22492451 Cpl Robert "Bomber" KNOWLES passed away in Gloucester Hospital on Sunday 8 January 2017 after a long illness. Bomber enlisted into the 1st Battalion The Worcestershire Regiment, MT Platoon. Serving 20 years, in Malaya, British Guiana, Germany, Cyprus and UK. Robert`s two sons also enlisted into the Regiment. In civilian life Robert was employed as a Ministry of Defence Policeman, then as a driving instructor. His funeral will be held at 1215 hours on Monday 6 February at Worcester Crematorium, Tintern Avenue, Astwood Road, Worcester WR3 8EB. Standards and members welcome. Letters of condolence can be sent to Mrs Jean Knowles. 10 The Hamptons, Wellington Road, Ombersley. Worcestershire. WR9 0EA. It is with regret that we inform you that 24515448 Pte John LAKING of Torquay died recently in Rowcroft Hospice, Avenue Road, Torquay TQ2 5LS aged 62. John served with C Coy 3rd Battalion The Worcestershire and Sherwood Foresters Regiment from 26 April 1979 to 25 April 1981. No funeral details known. It is with regret that we inform you that Arthur Lambert ex Worcetser & psi Kidderminster has passed away. (more exact details will be published when informed Arthur's funeral will be on Monday 28th July 2014 at 1200hrs at:- Wyre Forest Crematorium & Cemetery Minster Road Stourport on Severn WorcestershireDY13 8DE Telephone 01562 740850 Afterwards at The Kidderminster Masonic Centre (The Kidderminster Cricket Club Ground), Chester Road North (Offmore Lane), Kidderminster, DY10 1TH. To which all are invited. It is with great sadness that I inform you of the death of 311456 Capt Peter Rex LANGHAM MC who died on 9 February 2019 in a care home in Cheltenham, aged 94. Peter joined the Sherwood Foresters on an Emergency Commission, as a 2Lt on 4 Mar 1944. He was promoted to Lt on 4 September 1944 and then to a Temp Capt on 26 Jul 1946. He was awarded the MC in 1945 for actions when serving in North West Europe. He also held the 39-45 Star, France and Germany Star and the War Medal. His funeral will take place on Tuesday 19 March 2019 at 1330 hours at Willow Chapel, Cheltenham Crematorium, Bouncers Lane, Cheltenham GL52 5LT. Peter’s wife is now in a care home and there are no children, relatives or friends to attend the funeral. The RBL Cheltenham will be attending and would welcome the regimental family to attend to honour this World War II veteran. development of the Company where he was an excellent PSI and a very good ambassador of the Regiment. He left 1st Battalion The Worcestershire and Sherwood Foresters Regiment on 19 December 1977. It is with regret that we inform you that Worcester Branch member 23000153 Cpl Michael John LAYLAND passed away in Worcester Royal Hospital, on the 19th April 2017 aged 81years, after a short illness. Mike was born in Worcester in 1935 and enlisted as a National Serviceman into The Worcestershire Regiment at Norton Barracks, Worcester in 1953. Mike undertook a PT instructors course at Oswestry, where in July 1954, as a L/Cpl he won the Inter-Section Flag Competition. Mike went on to serve at Iserlohn, Germany before returning to Norton Barracks as PTI Instructor. During his service Mike was a member of a shooting team. On discharge from the Regiment Mike worked as a fireman on British Rail, later becoming a train driver. On leaving British Rail in 1981 Mike ran his own security business called 'Shopwatch'. Mike enjoyed fishing and followed horse racing closely, being a supporter of the Injured Jockeys Club. Mike spent several years as Chairman of the City Council’s Racing Committee and was made an honorary life member of Worcester Racecourse in 1988. In Public life, Mike became very well known in Worcester and beyond. He worked tirelessly for many charities and organisations. He was Chairman of Worcester Carnival committee for 27 years. In 1966 Mike became a Labour Councillor, later in 1972/73 he became City Chamberlain and then 1973/74 the last High Sheriff of Worcester. His first time as Mayor of Worcester was in 1981, and then as an independent Councillor Mike again became Mayor of Worcester in 2010. He took the salute at the official closing of Norton Barracks in 2011. 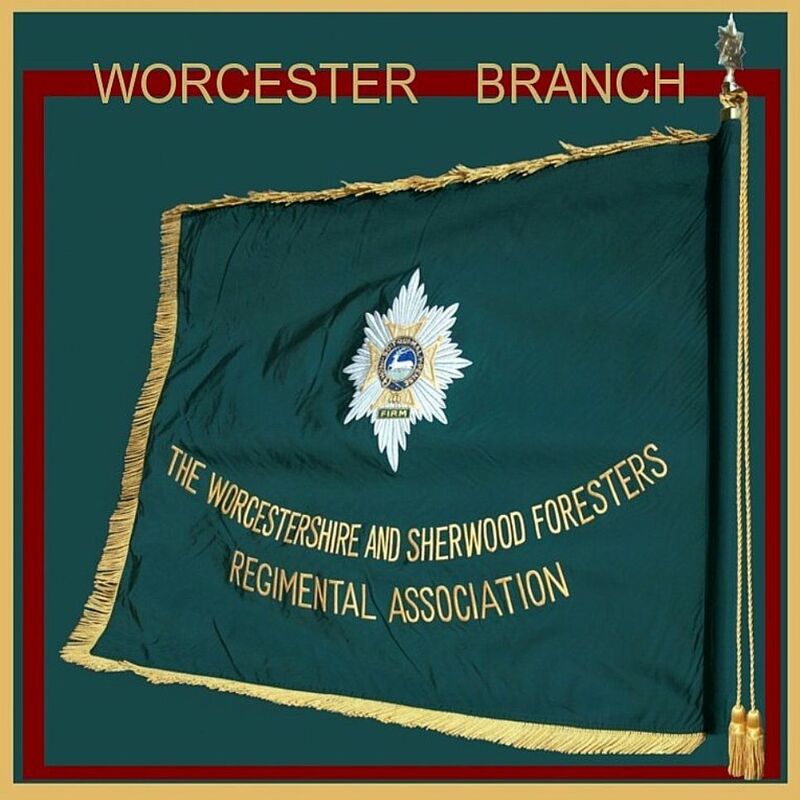 At a Worcester Branch meeting in 2014, to much applause, Mike received the news that he had become an Honorary Freeman of the City of Worcester, famous others being Lord Nelson who was the first recipient and Winston Churchill in 1950. The funeral service will be held at 14:30hrs on Friday 19th May 2017 at Worcester Cathedral. 8 College yard, Worcester. WR1 2LA . Family flowers only with donations to The Injured Jockeys Club. Standards welcome, with Worcester Branch Members to form a Guard of Honour outside the Cathedral. The service will be followed by a private cremation for family and close friends only. Mourners are invited to the upstairs Assembly Room, The Guildhall ,High Street, Worcester WR1 2EY. Letters of condolence can be sent to, June Layland . 75 Shap Drive, Warndon, Worcester. WR4 9NR. It is with regret that we inform you that 23248517 LCpl Kenneth LEA of Nottingham died on 17 May 2012 aged 76. Ken joined the Sherwood Foresters as a National Serviceman on 16 August 1955 and was discharged on 15 August 1958. After his Army service he worked at the Sugar Factory in Newark before becoming a lorry driver. His last job before retiring was as caretaker at Milford Primary School in Clifton. His funeral is to take place at 1115 hours on Friday 1 June 2012 at Bramcote Crematorium, Coventry Lane, Bramcote. Standards are invited. It is with regret that we notify you that 23534001 CSgt John LEIGHTON of Upton on Severn died on Monday 9 July 2018 aged 75. John enlisted as a boy soldier in 1965 and joined the 1st Battalion The Worcestershire Regiment serving in Minden, Gibraltar and Tobruk and with 1 WFR in N Ireland and Cyprus. He soon established a reputation as a fine shot and was a member of successful Bisley teams from 1965 until discharge in 1982. A natural shot he was arguably the most accomplished all-round marksman of the WFR era. He was a member of the Army 100 (rifle) 12 times, winning both the Silver Jewel (2nd place) and the Bronze Jewel (3rd place) twice. and was placed in the machine-gun, SMG and Pistol XXXs a total of 19 times. He was a member of the Army Rifle, SMG and Pistol teams on 14 occasions and of Army International teams 4 times. His greatest individual achievement was winning the NRA Service rifle championship in 1980. An exceptional record over many years which brought great credit to the regiment. The funeral will be held at 1200 hours on Monday 30 July at Upton-upon-Severn Parish Church WR8 9JQ. served with the Special Air Service 1955 to 1957, the Trucial Oman Scouts 1962 to 1964, then with MI 6 in 1965. He then served with the Infantry Junior Leaders Battalion 1966 to 1967 before being posted as a Lt Col with Quatar Armed Forces in 1968. This was followed by an appointment as a Col Chief of Staff in 1972. Derek retired from the Army in April 1978.
transferred into the Sherwood Foresters in February 1962 and served with the 1st Battalion in MT later joining A Coy and serving with it in Cyprus and Munster. He left the Regiment in December 1967 and then joined the TA in 1972. Dave was a staunch member of Derby WFRA. It is with regret that we inform you that 24866936 Cpl Timothy John LUNDY of Worcester died on 16 March 2017 aged 44 years. Timothy joined 1st Battalion The Worcestershire and Sherwood Foresters Regiment in January 1990. Whilst with B Company 1 WFR he served two tours in Northern Ireland and saw service in Jordan, Yugoslavia, Cyprus and Bosnia. In 1997 Timothy transferred to the Royal Military Police, being discharged on 28th September in Bulford with Exemplary conduct. In civilian life Timothy was employed in protective security in Baghdad, Iraq protecting the British Embassy Diplomats and staff. After this he joined Wiltshire Constabulary then the Metropolitan Police achieving 3 Commendations and Advanced level two driving qualification. The Funeral will be held at 1215 hours on Wednesday 12 April 2017 at Worcester Crematorium, Tintern Avenue, Astwood Road, Worcester WR3 8HA. Family flowers only, a collection will be held in aid of SSAFFA Worcester / RBL. Standards and Members welcome. After the service mourners are invited to the Retreat at Norton, Worcester WR5 2PT. Letters of condolence may be sent to Timothy`s Sister, Karen Hunt. 55 Mandalay Drive, Norton. Worcestershire. WR5 2PL.